Profits from my book will support Amnesty International as well as the HSUS, drug addiction recovery programs, and the HFH. 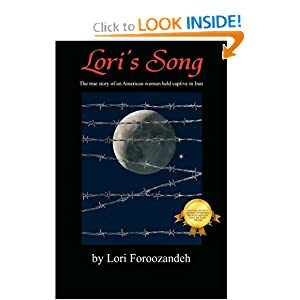 Lori’s Song by Lori Foroozandeh, is my true story of being held captive in Iran. This story encompasses not only the degrading and inhumane ways that woman are treated in Iran, but tells of my six weeks in a paramilitary camp in Iran. In this camp I was raped, tortured and beat along with many other people. We were put in this camp the day after 911. This story entails my childhood sexual abuse as well. I finally managed to mark your book as “want to read” on “Goodreads” and added it to my pile. I’ll let you know as soon as I got it, ok? Thank you Raani, I look forward to your review. I got a five star from MBR (midwest book review) and aren’t they supposed to be a tough one to get a good review out of? Lori, it’s a wonderful thing that you are doing in supporting these cause–perhaps if enough poeple do it might help stop the madness!! Good luck and God bless you!! So wonderful of you to devote so much to an area in need!